Thanks Wonderbag for sponsoring today’s post! 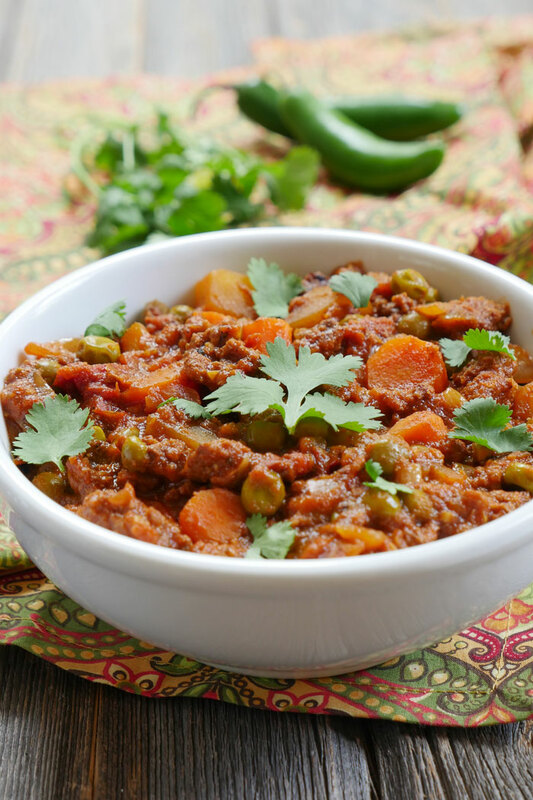 This Indian Ground Lamb is like an Indian version of chili or beef stew. It’s made with warming spices like ginger, coriander, cumin, turmeric and meat masala. Serrano peppers add a little heat and fresh tomatoes add a touch of sweetness. The potatoes, peas and carrots help make this one hearty meal. Slow cooking the curry helps fuse all of these flavors together, making for one delectable dish. You can use any slow cooker to make this recipe – but I made mine in my new Wonderbag. It’s a pretty neat device – it’s a slow cooker that doesn’t use any energy. Yep, that’s right – you don’t have to plug it in. It’s perfect for camping, tailgating, potlucks, picnics or you know… if the world ends (kidding). I plan on using this to keep my food warm during my next dinner party – it’s an instant conversation starter. Now, you should know that this is a fairly large bag – one that will have a dedicated spot on my counter during the winter months. In the summer time, I plan on storing this in the trunk of my car – because it’s also great at keeping things cold. I’ll be able to buy my coconut ice cream and keep it cool while I run errands. Much better than running home to put ice cream in the freezer. Melt ghee in a saute pan over medium heat and saute onions until golden brown. Add ginger, garlic and serrano pepper. Stir-fry for a minute then add tomatoes. Cover pan for 5 minutes. Add spices and stir-fry for one minute then add the ground lamb. Once the meat is fully browned, add it to your slow cooker along with peas, carrots, potatoes and tomato sauce. Melt ghee in a saucepan on medium heat, and add onions. Once the onions begin to brown, add ginger, garlic, and serrano pepper. Stir-fry for a minute then add tomatoes. Mix well and cover pan for five minutes. Add the spices and stir-fry for a minute before adding the ground lamb. Once the lamb is fully brown, add peas, carrots, potatoes and tomato sauce. Combine well, raise heat and bring to a boil. Once boiling, put on cover and cook for another few minutes. Then remove from heat and place inside the Wonderbag. Cover the Wonderbag with the insulating lid and pull drawstring to secure. PAID ENDORSEMENT DISCLOSURE: Thank you Wonderbag for sponsoring today’s post! In order for me to support my blogging activities, I may receive monetary compensation or other types of remuneration for my endorsement, recommendation, testimonial and/or link to any products or services from this blog. I’ve been curious to try the Wonderbag since I heard about it. Love the blog! I grew up in Australia so I love lamb…it does have a bit more of a gamey taste but I love it, this recipe looks wonderful…two of my favorite things…curry and lamb…win win. Oh I can’t wait to make this delectable and easy dish!! Thank you! Hi Ashley, I heard about Better Homes & Gardens Blogger Awards. I nominated your blog. Cori, thank you SO much! I’m so honored 🙂 I really appreciate this!! I am absolutely excited about trying this lamb stew and your Naan bread…LOVE Indian food and have been on an absolute Indian food kick for the last week. In fact I’ve been seeing ground lamb at the store and wondering…What could I do with that? Would love to try this in a Wonderbag! So far I have absolutely loved your website. However, as much as I would like to try this recipe peas and potatoes are very controversial for paleo. What do you suggest for substitutions? Hi Annette, you can leave out the peas and use sweet potatoes. Hope that helps! I’ve never had lamb before but I’d be willing to try this recipe. I don’t eat lamb, but this looks like a good recipe for those that do eat lamb. Carla, I use grass fed beef mince because I don’t like lamb and it is just as delicious! I just discovered the Wonderbag last night perusing Amazon’s slow cooker offerings. What a perfect way to go “off grid” and still have slow-cooked food. I want! AND this recipe looks phenomenal, too. I love curry, and this looks like a rich and hearty recipe. I am allergic to ginger, so I would have to tweak it just a little. I am also thinking about adding sweet potatoes in place of the white…. Ok! I’ve come to a different post and now I see the recipe. Actually, I clicked on the page for the recipe. I made curry last night for dinner. Then today this caught my eye. Love curry and thoroughly enjoy the things you share. Thank you!. Oh I really want a Wonderbag! Thanks for the giveaway and all of the recipes. We make your naan recipe often. So easy and my kids love it. Jenna, so glad you liked the recipe!! 🙂 Thanks for letting me know! Hi Melissa, it will serve 2-3 hungry people 🙂 Let me know if you try it! Hi — I increased this recipe by 1/2 for my family of 6 last night. I used rutabaga instead of potato since it is lower on the glycemic index (and tastes great in stews). Everyone in the family liked it except for the youngest. If I make it in the future, I will make a few more changes. Thanks for the base recipe! Ashley, thanks for the great recipe! We made and ate this last night, enjoying the great flavor and how easily it came together. I used one white potato and one sweet potato (because that’s what I had handy). Calorie-wise, it makes four very generous portions of about 550 calories or 6 modest ones at about 350. Husband had it with rice and I had it over a bed of spinach. 4 more portions now in the freezer – yay and yum! I also love your Naan recipe. Can’t wait to try more of your creations! 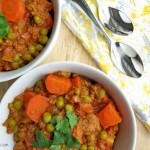 Ashley I love your blog, you make cooking Indian food easy and enjoyable! This is my favorite dish of yours so far and I paired it with your three ingredient Naan bread for an incredibly delicious meal. This recipe is delicious! A crowd-pleaser! I wanted to finally comment on this recipe after making it numerous times with great success! This is my favorite recipe of yours, but I love your recipes in general. I noticed you recently posted a Instant Pot version of this recipe. Awesome! I’ll have to go try that out and comment later. I see the recipes are almost the same…my only concern is that I like to make a double batch of this (and freeze it in batches), which fits (barely) in my slow cooker, and I’m afraid doubling the recipe would be too much for the Instant Pot (or am I wrong?). 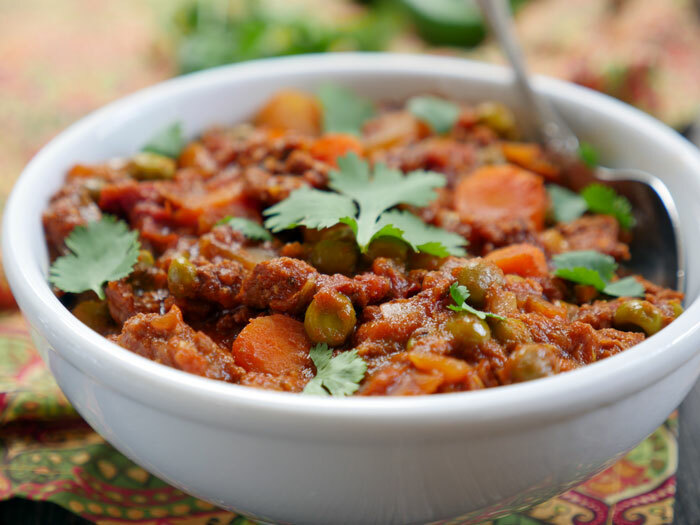 I actually cook a lot of Indian food otherwise, and this is one of my go-to meals 🙂 It’s delicious, and I really like how it’s a one-pot way of getting in some veggies! The only difference I make to the recipe is that I don’t add garlic – and it’s still great. My only complaint is that it’s time consuming to make 😉 All the cutting takes a long time, but I’m trying to find ways to shorten the process – last time I stuck my tomatoes in a food processor haha. And one time I used canned chopped tomatoes (gasp!). Anyway, it’s well worth the effort. I’ll have to go back and comment on some of your other wonderful recipes as well. Thanks for the thoughtful review! I think you can double it in the Instant Pot – I haven’t tried but I think it would fit? 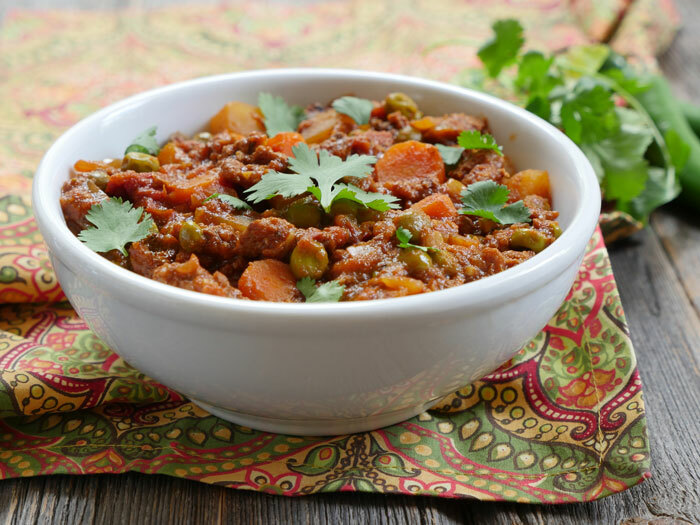 If you try let me know – I love making Indian food in the Instant Pot because it’s so quick! There is no liquid in this. Will there be any sauce or is it dry? Hi Karen, it’s more of a dry dish. That dish was the best!!!! Absolutely will make it again. The potatoes soaked up the spices like a sponge and was possibly better than the lamb chunks!